This entry was posted in software, Tests / Reviews, Uncategorized and tagged ACR, ACR 5.7, Adobe Camera Raw 5.7, beta, Beta 3, Canon EOS 550D, Lightroom, Lightroom 3 Beta 2, Photoshop, T2i, Ti2, v2, version 2 by publisher. Bookmark the permalink. Thanks for that test, David, I was considering downloading the Beta and was too lazy, assuming nothing much had altered in the processing. I’ve recently done a job that needs the NR that you’ve just demonstrated – great stuff! We shall see the results in the morning. David – Excellent article. 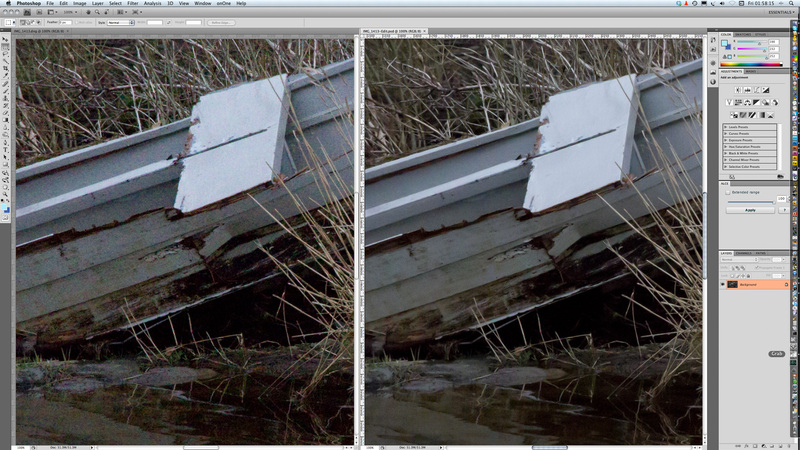 My confusion with NR setting is lightroom is whether or not there are standard (default) settings or is it just a question of moving the sliders until it looks right? I have some colour noise on images taken with the EOS 1Ds II, at 400 ISO, with a polarizing filter, especially in the blue sky. I can remove the noise with your suggested setting – 25 luminance, 50 color but the building looks a bit over-flattened. Blue sky noise is common to all cameras and can not easily be eliminated. It is a result of the low sensitivity to blue of the sensor, which results in a very noisy red channel (the brightness or gradation of sky blue is mainly down to the red and green channel levels, not the blue channel level). The way to correct this is to overexpose (expose to the right) but it can be a dangerous method with Canon cameras of your vintage, if there is a bright horizon, bright clouds, or sun in the sky – you may get loss of saturation or a colour shift when correcting the exposure in raw. An easier method, which very few photographers understand properly, is to add a Wratten 85 (artificial light film to daylight) conversion filter and set the camera to Tungsten light balance. The warm (brown-orange) filter boosts the red channel level at the taking stage, and evens out the response between the three channels, resulting in less blue sky noise when the raw file is converted (at Tungsten setting of course). The UniBalance method calls for a special filter pack, usually including something like a 40-50 Magenta, to exactly level up the three channels in true sensitivity and headroom and this creates the lowest possible noise. But the 85 filter is a quick, easy off the shelf fix. Thank you David – extremely authoritative and helpful, as always! I’ll certainly consider a wratten 85 filter (I know I had one years ago). But, the “with Canon cameras of your vintage” statement is making me wonder if I should keep my money in my pocket while I’m saving up for a new(er) model? Your thoughts on my camera purchasing dilemma are welcome. Generally later cameras have better dynamic range and noise control, so the makers have shifted the exposure to the left (hence the extreme high ISO ratings we now get). They just underexpose more. The latest Canon models with Highlight Tone Protection go even further and definitely underexpose the shot – at risk of more noise. But no more burned out wedding dresses, no more sky colour which turns lurid green just above the bright horizon when you get the best blue up above!